If you haven’t been docked in a space lab for the past 30 years, I’m sure you’ve been asked to complete a customer satisfaction survey, after a recent shopping experience, whether online or offline. In fact, even in space, it’s probably not a stretch to assume that NASA conducted a few with their astronauts to gain feedback on behalf of their product partners. Perhaps Cottonelle or Charmin wanted to measure astronauts’ satisfaction regarding their toilet paper products in space. Ok, maybe this is not a clean (pardon the pun) example, but you get the point. Customer satisfaction surveys are all the rage for a reason. After all, businesses want to remain competitive, increase their customer retention, provide better service and ultimately increase their profit margins to stay in business. To achieve these goals, businesses need proper feedback from their customers. Unfortunately, customers’ attention spans are rapidly diminishing. The typical survey response rate is often below 2%, but the problems with customer satisfaction surveys don’t stop there. The reality is that a small number of people who participate in customer satisfaction surveys are likely doing so in response to a particular product or, in most cases, a particular bad experience. In essence, the overall survey results can be largely skewed. Yes, many experts will point to their top 10 lists of possible solutions. However, the big elephant is still in the room. So, what’s going on? A well-respected colleague and industry expert (Bill Fonvielle) suggested that at least part of the problem is that customer satisfaction is an abstraction and not a thing itself. He went on to quote the late, renowned marketing professor Richard L. Oliver who made this statement – “Everyone knows what [satisfaction] is until asked to give a definition. Then it seems, nobody knows.” In Bill’s view, when people say on a survey that they were satisfied, they are saying that the experience was okay, and nothing more. They are not saying that they were thrilled, excited or delighted. People are either satisfied or dissatisfied. He compares it to being pregnant. No one is a little pregnant; either you are or you are not. He went to say that rating scales invent distinctions that may not make sense. What is the message for businesses contemplating a customer satisfaction survey? A better path begins with asking customers to tell you what their expectations are, and using expectations to measure, not customer satisfaction, but your performance in meeting or exceeding customer expectations. 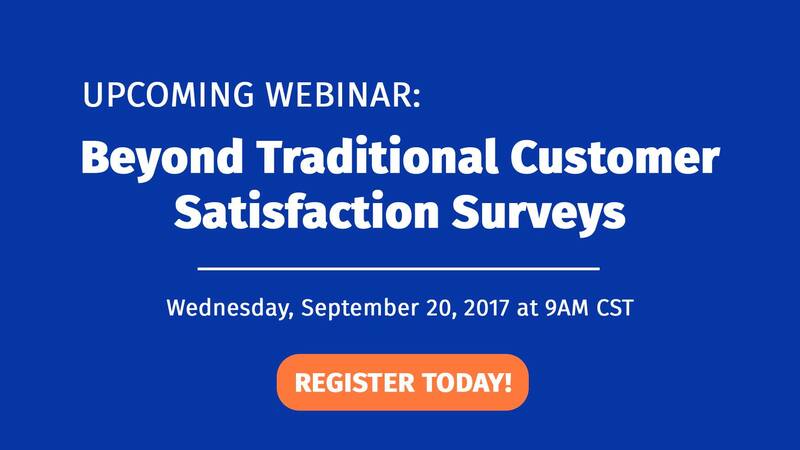 Join us for our upcoming webinar, as Bill and I discuss why customer satisfaction surveys don’t satisfy and what to do about it.